The Safari Pro+ is a highly adaptable system that enables you to carry your photographic equipment in several ways. 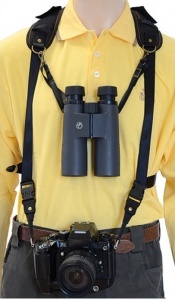 In harness mode, your camera body slides along the webbing in front of you, and is attached by its sides by short straps equipped with buckles each able to take 15kg. This is the ideal mode if you want two points fixation and peace of mind for heavy or expensive equipment. In Swing mode, you wear a camera body on each side of the hips (so as to balance the weight). The fastening method on each camera body is with a base screw in the tripod bush and is only recommended for medium weight cameras. For very long telephoto lenses, it is also possible to use the two base screws fasteners to carry your equipment (one camera body with a telephoto) at the front, bearing in mind weight limitations. 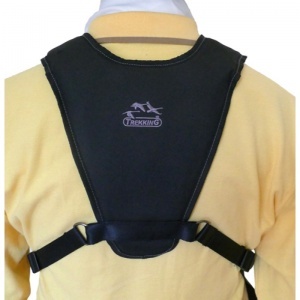 In all of those cases, the harness Safari Pro+ ideally distributes the weight across the shoulders and back, so that you no longer have to suffer from neck pain!